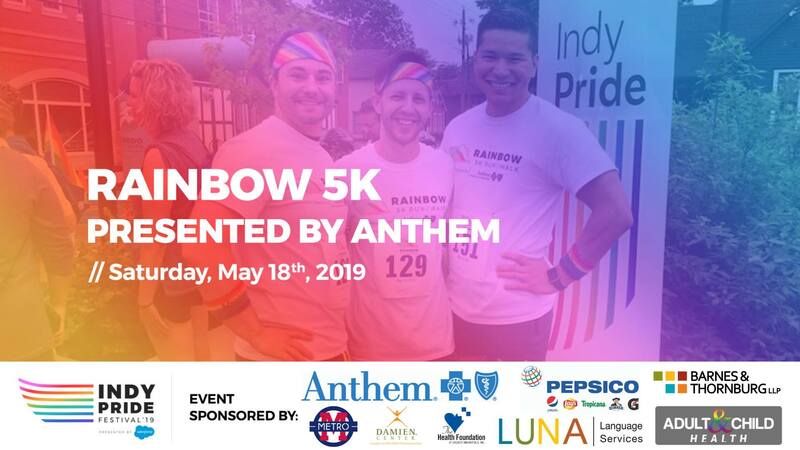 Indy Pride Rainbow 5k Run/Walk Presented by Anthem | Indy Pride, Inc. The 8th Annual Rainbow 5K Run/Walk for Pride is a great event for those trying to beat their personal best and those simply trying to stay active. This is a family friendly event, with special youth registration fees for kiddos 13 and under that want to walk or RUN! Early Bird Registration prices are offered, so sign up now! Unique race shirts are included in registration for anyone who signs up prior to May 6, 2018. Registration on and after May 6 will not guarantee shirts and size preferences. The event will start and finish at the IFD Union Hall parking lot at the corner of E. St. Clair St. and N. College Ave. (748 Mass Ave.). Indy Pride is teaming up with QUIT NOW INDIANA to encourage healthy lifestyles for all members of our community with all Pride events being tobacco-free. For support and resources to quit tobacco, visit them on the web or call 1-800-QUIT NOW. A special thank you to our Presenting Sponsor Anthem! We would like to also thank our supporting sponsors: Adult & Child, Barnes & Thornburg, LUNA Language Services, Pepsico, The Damien Center, The Health Foundation, and The Metro! Without your support, this event would not be possible!